It Works For Me. Sharon Booth Shares Her Personal Writing Rules. 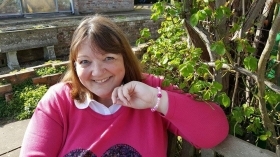 This week, I am delighted to welcome Sharon Booth to my blog to talk about how she tackles her writing. 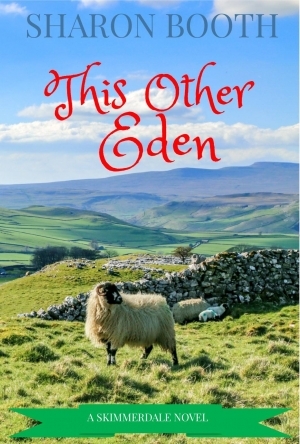 Sharon is the author of three romantic comedies, There Must Be an Angel, A Kiss from a Rose, and This Other Eden, all set in her beloved Yorkshire. She has also written for The People's Friend. She lives in East Yorkshire, is one tenth of The Write Romantics, and a member of the Romantic Novelists' Association. She has a love/hate relationship with chocolate, is a devoted Whovian, and prone to all-consuming crushes on fictional heroes. The situation has recently become critical since she was given a DVD of Outlander for Christmas. I hadn't actually thought much about my "rules" until Susanna asked me to contribute to this series. I had to take a moment out of my busy schedule (after Emmerdale and Coronation Street, of course) to consider what writing rules I lived by. My conclusion was that I have failed to follow almost every rule I feel I should follow. Things like "write every day", and "stay off the internet", and "finish one piece of work before starting another", and "stay off the internet", and "just write and fill in the details later", and "stay off the internet"… Well, the intention is there. Clearly, my biggest failing is that I don't stay off the internet. So what rules do I actually follow? Here, for what it's worth, is my conclusion. Although, I hasten to add, just because I do these things, it doesn't mean everyone else should. I think every writer has to find their own way, and do what works for them. Although, I think it's pretty fair to say that everyone should stay off the internet! (Except when reading blogs like this one, of course. Phew!) So— here's what works for me. Make a fairly detailed outline of the story. This is essential for me because, otherwise, I would end up with about two hundred and fifty thousand words – and I'm not joking. I know the beginning, I know the end, and I know the key scenes that I want to include in the story. Be prepared to hate the beginning, and realise that it doesn't work at all. Accept that those crucial "key scenes" might well not fit in, after all, and may be the literary equivalent of Zopiclone, guaranteed to send even yourself to sleep, never mind your readers. In which case, it's probably wisest to leave them out. Characters you thought were amusing may get on your nerves. A minor character might suddenly have an awful lot of interesting things to say. You may reach the final scene and discover it's completely different to the ending you'd envisioned. Don't panic. In short, having a structure to work with is good, but stories have a habit of taking off in unexpected directions, and that's okay. It's allowed. Accept that you will, at various points, despise your writing. You will read it so often that it will become the most loathed piece of work in existence, and you will be convinced that it's only fit for the recycle bin, after all. This is normal. Do not delete! Go off and read something else. Go for a walk. Watch a film. Superglue your hands to your desk, if you must, but do not delete! This feeling will pass. Occasionally, you may even catch yourself feeling oddly proud of your work. Those moments are fleeting, but they do happen. Keep the faith. Be kind and supportive to other writers. Seriously, it's a tough world out there, and we need to help each other all we can. So retweet, share blog posts, leave positive reviews if you've enjoyed their books, publicise new releases, encourage and praise. Read lots of other books. Don't let your reading world shrink down to the stuff you've written. Read as much as you can, and read different genres, try new authors. There's so much to learn from other writers, and there's so much to enjoy in those pages. Never stash chocolate in your desk drawer, just in case. And I say that as one who is, as I write, sucking on a Rolo. Get social media stuff out of the way, as soon as you switch on your computer, then stay off the internet! I'm interested in what you both say, Jen and Sharon, about using old writing. I wonder how much re-working you have to do on it to bring it up to the improved standard of your current writing. Thanks for commenting, Jen. I'm so pleased to have introduced Sharon to you. A similar thing happened to me, Jen. I recently discovered some scenes I'd written four years ago, which are perfect for the book I'm currently writing. So glad I didn't delete them! Thank you for commenting. Another fab post in this series. Much useful advice for all writers. As for never throwing writing away, I wholeheartedly concur! I've just used parts of a scene I wrote five years ago in an entirely different book...different characters, plot, issues and setting but yet...parts of it fit. Also interesting was seeing how much I've grown as a writer since I first wrote the scene and the new tools I have to make it better. Thanks for introducing me to Sharon, Susanna. She's a new-to-me writer. Oh, the lure of the internet... You made me laugh, Emma. Thanks for commenting. Thanks for your comments, Jan. It's always lovely to hear from you. Like you, I was glad to discover that other writers don't always stick to the rules they know they ought to be following! Good luck with your second novel. I'm glad you enjoyed it, Jan. I wonder if anyone actually keeps to their rules? :) I do like to have a good idea of where I'm going when I set off on my writing journey, but you never know when you're going to discover something new and exciting along the way. So, while I like to have an ordnance survey map to hand, that doesn't mean I'm not going to meander off route if I feel like it! More often than not, I end up at the destination I had originally planned. I've just taken the scenic route. Actually, I do this in real life, too. My husband swears I add about a third more miles to any journey we undertake, because I deliberately misdirect him. Well, I like to try new routes. They may be more interesting than the one we had planned...Thanks very much for commenting. Oops!... 'know' Rule and note to self: Check post for typos before clicking 'Submit'! Thank you, Sharon and Sue, for another great post. It was very heartening for me to know you break rules that you know you should follow. I agree with your first point about planning. I'm starting to think about novel number two and like you I like to now the beginning, end and key scenes. I'm glad I'm not the only one to 'keep' everything I've written. I agree with you, Ellie. Sharon has made some excellent points. I especially like the one about being supportive to other writers. Thanks for your comment.